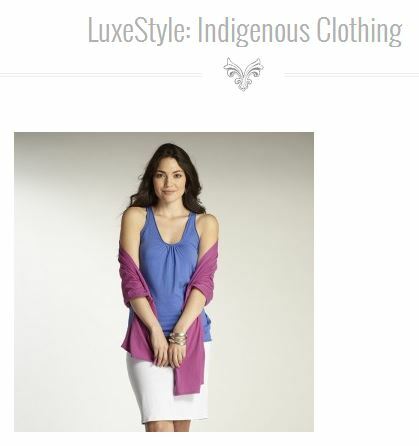 Congratulations to our Client Indigenous Clothing for their feature on Luxe Soul Living! Indigenous organic + fair trade fashion has been leading the way in stylish, handmade fashion since 1994. All Indigenous’ sustainable apparel is made with extreme care by artisans who are paid a Fair Wage. IndigenousÂ is anÂ all natural fiberÂ company, utilizingÂ marinoÂ wool,Â alpaca,Â silk,Â organic cottonÂ and other fibers created by nature. In many cases,Â IndigenousÂ utilizes the natural colors of organic cotton and fleece, eliminating the need for dyes to achieve complex color schemes within their fashion collections. Indigenous also develops low impact dyes which contain no heavy metals and are Azo – dioxazine compound free. Indigenous is one of a very few apparel companies that have been awarded the prestigious international Social Responsibility Business Awards for pioneering social and environmental integrity within the apparel industry. Wear your values! Check them out at Indigenousclothing.com!